Vacation rental house. Sleeps 4, 3 bedrooms, 3 bathrooms. No pets allowed. Welcome to Where Eagles Soar! Enjoy expansive views from the decks. Covered decks wrap around both sides of the home. This comfy, cozy living room opens to the dining room and kitchen. Gather for conversation and reflection in front of this wood-burning fireplace. Dining room includes a sitting area. 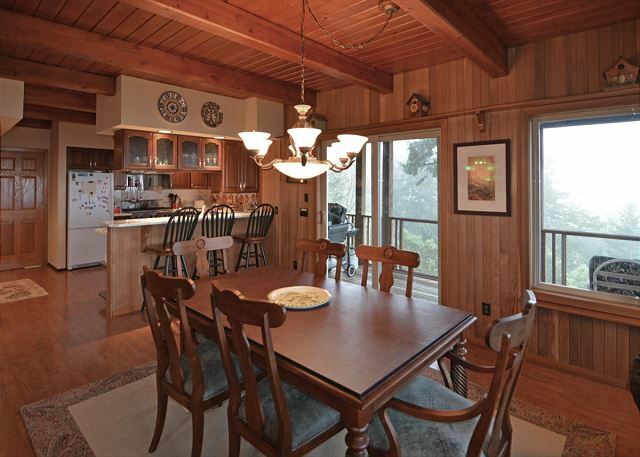 The dining room opens to the decks and kitchen area. 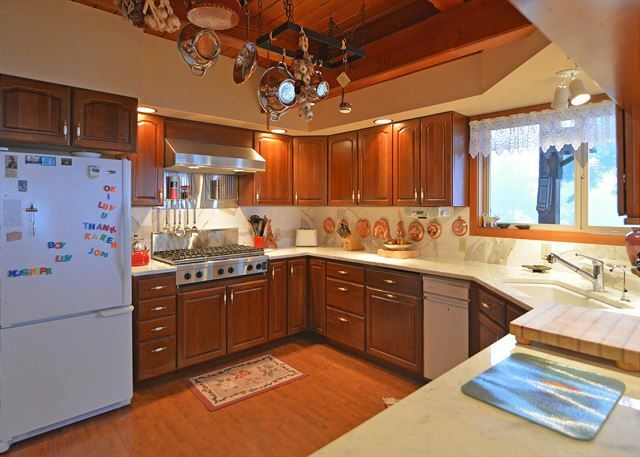 Cooks will love this fabulous kitchen! 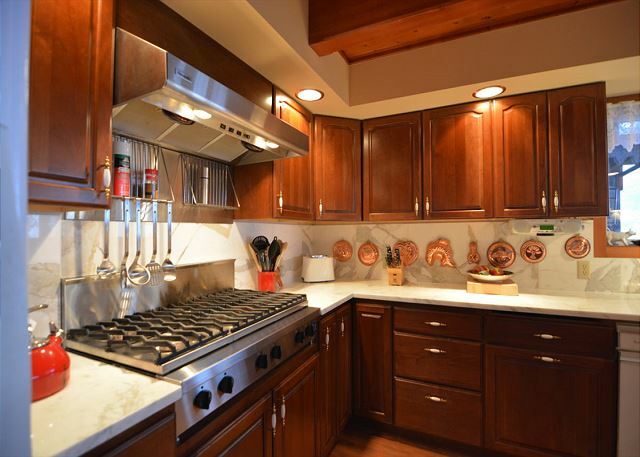 The kitchen, with great gas cooktop, is large enough for everyone to share meal prep. 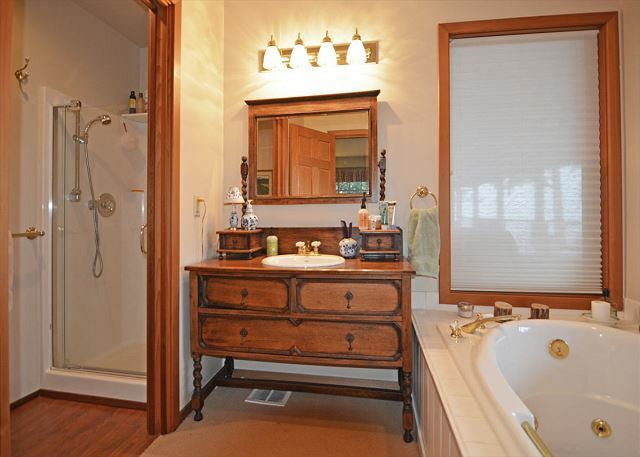 The master bedroom is upstairs and offers a private deck and ensuite bathroom. 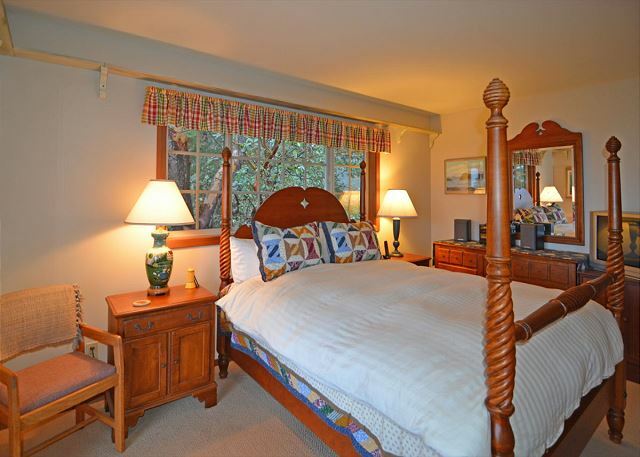 This second master bedroom, also with ensuite bathroom, is on the main level. 2nd master bedroom includes a jetted tub. 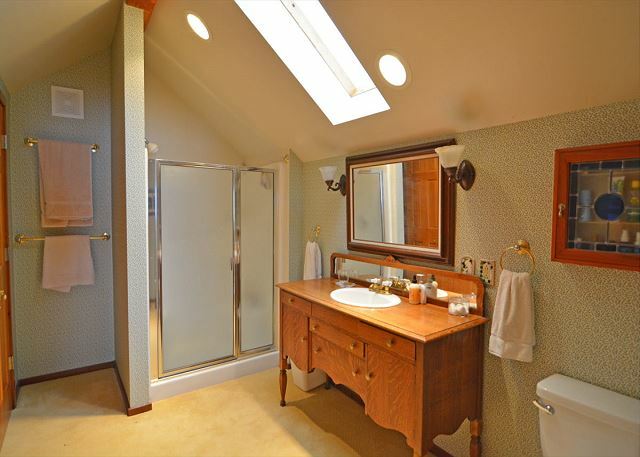 There are two twin beds and an antique vanity in the large upper loft. 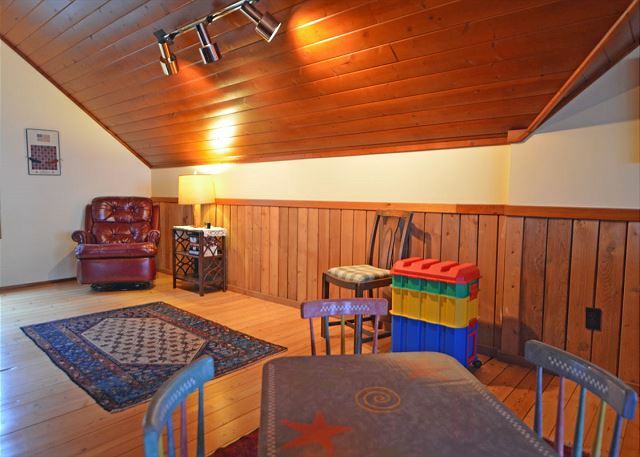 Play spaces in the large open loft allow a great area for kids to play. AVAILABLE ONLY FOR 30 DAY MINIMUM RENTAL. 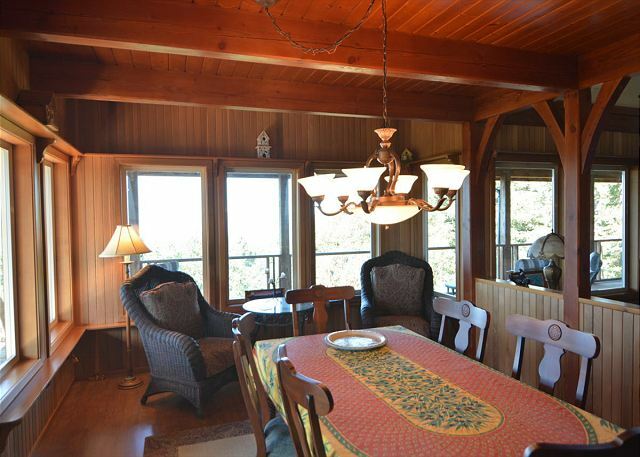 You will share the lofty perspective of a soaring eagle when you book this spacious rental on San Juan Island. 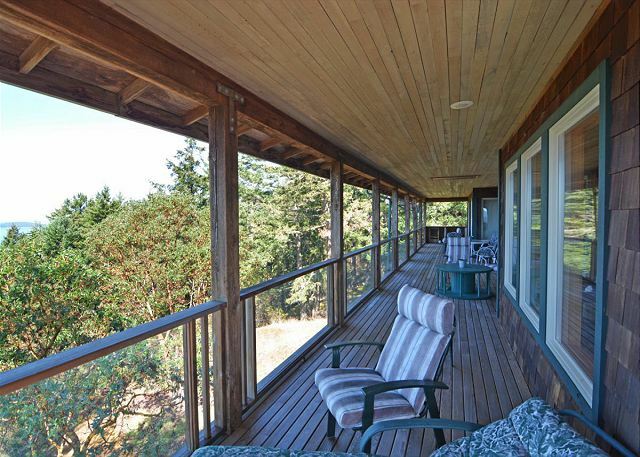 This comfortable residence offers a 180 degree bird’s-eye view of wooded hillsides, northern waterways, neighboring San Juan Islands, and a location that cannot be beat. This three acre property is at the end of a lane, overlooking a panorama of forest and sea. The home is sited upon a knoll, bordered by multiple covered decks that beckon you to come outside, relax, and enjoy the view. You will feel remote and serene as you gaze upon the natural splendor, yet because central Friday Harbor is only two miles distant, it is easy to find the convenience of shops, restaurants, the ferry landing, and numerous town activities within close proximity. 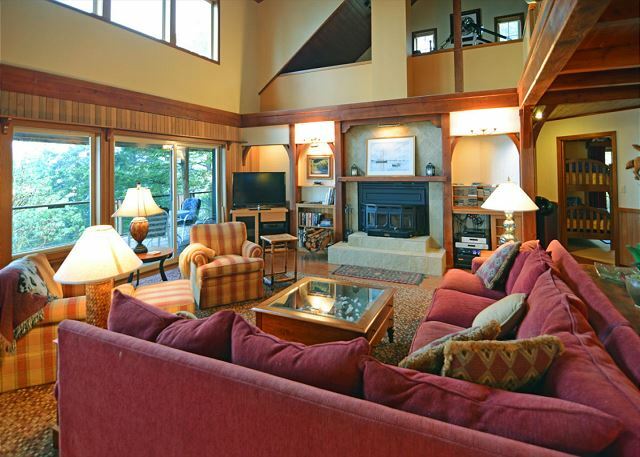 The residence has a hint of Adirondack lodge, featuring warm woods, generous room dimensions, and expansive public spaces. It is equipped beyond most standards of a vacation rental with amenities that include quality furnishings and housewares, plush seating, and custom décor. The flexible and separated spaces make this a home that will appeal to small families and couples alike. On the main level, the living room is elevated by a vaulted ceiling and there is plenty of seating focused toward the view, a wood burning fireplace, and an entertainment center that includes an Apple TV, so you can download the latest movies and TV programs. The semi-formal dining room is adjacent, separated from the kitchen by a bar with seating. The kitchen, with a six burner gas cook top and marble counters, is a grand space that welcomes all to assist in meal preparation. There is also a large laundry room beyond the kitchen. 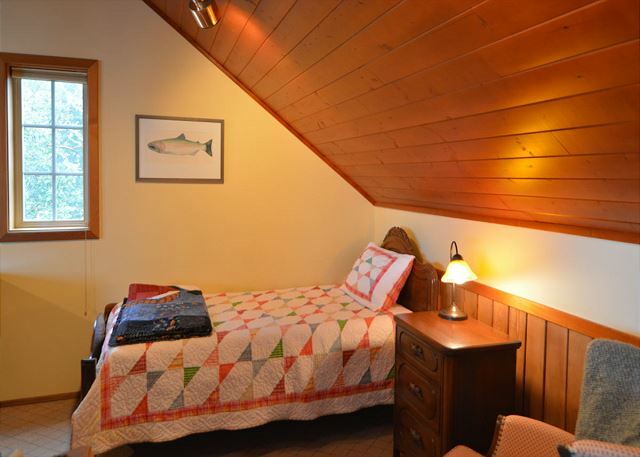 Two bedrooms are on the main level, one is a full master suite, offering a queen bed, DVD/VCR, and en-suite bathroom with separate stall shower and jetted tub. An office with a desk is also on the main level. Upstairs, there is a large second master bedroom with queen bed, complete with a seating area, deck, and en-suite bath with shower. 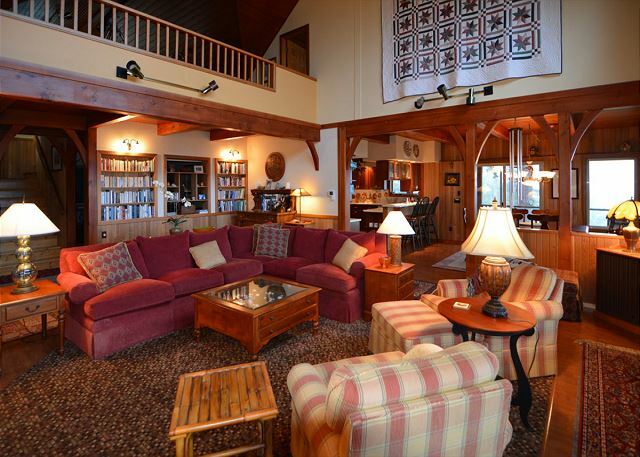 In addition, there is an expansive loft that opens to the living room. This area contains a desk, game table, and children’s furniture, as well as two twin beds around a corner. This home is rented on a monthly basis so it is a perfect choice for those who wish to share a stay with other family members, come and go frequently from the mainland, or simply try on the island lifestyle for an extended period. For those needing moorage, a buoy adjacent to the Port of Friday Harbor may be available upon request. The home cannot be booked on line, so please call the office for additional information. During the Quiet season dates of October 15th thru April 30th is a $250 per month utility charge. Please Note: the entertainment system is sophisticated and designed for watching movies. Cable coverage may be acquired as an option if you are staying for multiple months. Verizon cell coverage is good but reception may be limited through other mobile providers. Also note that there is a significant drop-off at the edge of the ridge areas below the decks, so vigilance will be required when renting with a small child. greatplace to gather friends and relatives. Like everyone who comes here, I never want to leave. Three weeks is not enough (missed 1st week due to work). The house is comfortable, spacious, well appointed with quality art and classic reading, and has a completely outfitted kitchen suitable for serious cooking. The wrap around deck and 2d door balcony are wonderful places to spend your evening, watching the sunset and the eagles hunt. Lovely experience and I hope to return often. We stayed for two months from Sept. 20 thru Oct. 30th. We really enjoyed the house and views. Great place.